As the top two Democratic presidential candidates, Hillary Clinton and Bernie Sanders are battling for the support of America's largest workers' unions. For liberal politicians claiming to fight for workers' rights, union support can make or break a campaign. Clinton gained a big advantage over Sanders Tuesday when a national union representing two million Americans endorsed her for president. This is just one of many unions with influence, though, and which candidate each big union supports, and which groups are still undecided, are pretty important for the future of Clinton and Sanders' bids for the White House. Although Sanders' record on labor issues and income inequality is more consistent than Clinton's — he even supports a $15 minimum wage, while she advocates for a $12 minimum — many unions support Clinton for the 2016 nomination. As The Wall Street Journal pointed out, this is likely a pragmatic choice. They want to back the Democratic frontrunner, rather than a candidate less likely to win. Regardless, their support reinforces her agenda to "protect and strengthen America’s workforce," as her website claims she will do. The American Federation of Labor and Congress of Industrial Organizations (AFL-CIO), a federation of unions consisting of 12.5 million workers, would be a huge get for either candidate, but it usually waits until it's clear who will be the Democratic nominee before pledging its support. Here's which candidate each of the nation's top ten labor unions supports, and which have yet to decide. The Service Employees International Union (SEIU), which represents two million workers in the service industry and was behind the fast food workers' $15 minimum wage fight, announced its support for Clinton Tuesday. SEIU President Mary Kay Henry said in a statement: "Hillary Clinton has proven she will fight, deliver and win for working families. SEIU members and working families across America are part of a growing movement to build a better future for their families, and Hillary Clinton will support and stand with them." 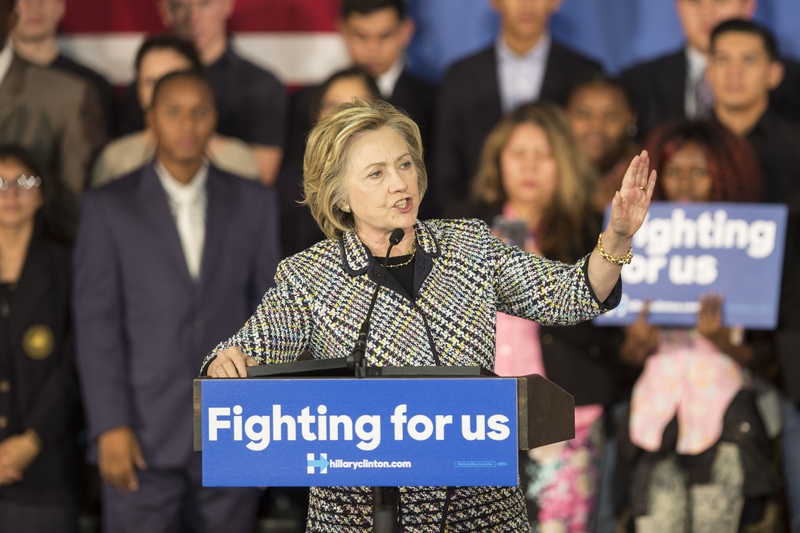 The union for public employees, the American Federation of State, County and Municipal Employees (AFSCME), announced its endorsement for Clinton after two-thirds of its more than one million members backed her campaign. Clinton also received the endorsement of the nation's largest labor union, the National Education Association (NEA), in October. NEA President Lily Eskelsen Garcia said she supports the Democrat "because she understands the road to a stronger U.S. economy starts in America's public schools." Similarly to the NEA, the American Federation of Teachers (AFT) supports Clinton. In a July press release, the AFT said: "Hillary Clinton is a tested leader who shares our values, is supported by our members, and is prepared for a tough fight on behalf of students, families and communities." The International Brotherhood of Teamsters, known for representing freight drivers and warehouse workers, hasn't endorsed a candidate yet, but reportedly tried to meet with Donald Trump. Endorsing Trump would be a surprising move for a union, as they generally back Democrats. The United Food and Commercial Workers International Union (UFCW) also remains undecided. Joining the group of unions waiting to endorse a presidential candidate, the United Steelworkers (USW) haven't announced who they want to win the Democratic nomination. The United Auto Workers (UAW) remains undecided about 2016 as well. The International Association of Machinists and Aerospace Workers (IAMAW) endorsed Clinton in August, after a unanimous vote by union leaders and a survey of members. IAMAW International President Tom Buffenbarger said in a statement: "Hillary Clinton has been a strong supporter of this union for years and she is now the target of unprecedented attacks, financed on a scale never seen before. The time to help is when help is needed most, and we intend to do just that." The International Brotherhood of Electrical Workers (IBEW) has yet to endorse a candidate.